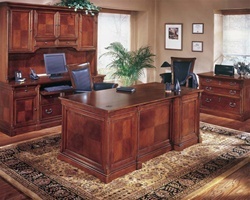 Vast selections of office furniture such as desks, credenzas, hutches, bookcases, buffets, and much more! With the rapid, fast paced evolution of technology, the workplace has changed more than ever. Since most people can now work effectively from almost anywhere, a Home Office that makes a statement is a must. We offer a Large Selection of beautiful, functional furniture that matches any décor. This selection of office desks and furniture ranges from the cool and contemporary to the classic and elegant veneer and laminate. Styles include contemporary, classic, modern and even traditional. 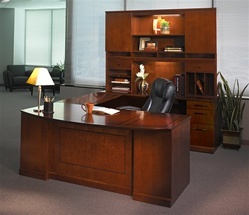 Find a simple desk or a large office suite, depending on your needs. We offer a wide variety of reception desks for sale from modern reception desks, salon reception desk, contemporary reception desk and much more. Different shapes and sizes are available to fit your needs. The location of modern offices is based more on efficient use of space and the ability to gain the most productivity out of any space, which you use. Here at Ofconcepts we know that the location and type of office our customers use may not necessarily be in a commercial area. Keeping in mind that many small business owners have home offices, we carry notable lines of office furniture that not only coordinates with your space at home but also with home office desk chairs that you would need for your home office. Having the right kind of affordable office furniture that is capable of being used in any home office setting gives the budding entrepreneur the same footing as other business. The selection of office desks and furniture that is available at Office Furniture Concepts ranges from the cool and contemporary look to the more classic, traditional and elegant style. The different office furniture options comes in veneer and laminate finishes which have been proven in many different office settings for their durability and resilience to whatever is thrown at it in the workplace. With many different lines of office furniture from the more classic and traditional Presidential series to the more ergonomic office furniture series like the Amber series to lastly the more modern and contemporary office desk like the Adaptabilities series of furniture. With so many different lines and choices of affordable office furniture, customizing and making a unique style for your office is only limited by your imagination. First impressions are usually the longest lasting image that is projected about a business and a product. When there is a need to make a strong, immediate and powerful statement about your business or office, a beautifully composed reception room will do that. 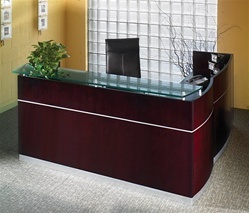 The central piece of office furniture in any reception room is a reception desk. Having your company logo and insignia associated with a stylish and strong reception desk that is either a sleek contemporary look, a strong classic style or a timeless traditional tone with intricate designs and moldings. With this wide selection of fancy, smart reception desks built to suit your office needs Ofconcepts will aid you in not only be the one to set the first tone but also the one who will display your business on a higher footing than you competitors.